As will be often observed, these early posts which took place prior to my premonition of this platform will often be lack the forethought to take both "before" and "after pictures. Unfortunately for you all, one such case can be seen below. Dan Robinson conducted a demonstration at his garden for the Evergreen Bonsai Association (which meets in Bremerton, WA, across the sound from the Puget Sound Bonsai Association which meets in Seattle, WA). Dan primarily dedicated the demonstration to carving with a die grinder as it is an accessible and powerful technique which relatively few in our art take advantage of. The results depicted speak for themselves (*with the help of their captions). This is a mugo pine that Dan has been allowing to grow relatively unhindered for a number of years before he selected it for this workshop. Before his work began, the tree was leggy with many different arms to choose from. The obvious style would have been to aim for a windswept look, however, Dan wanted to go for something less obvious - a cascade. 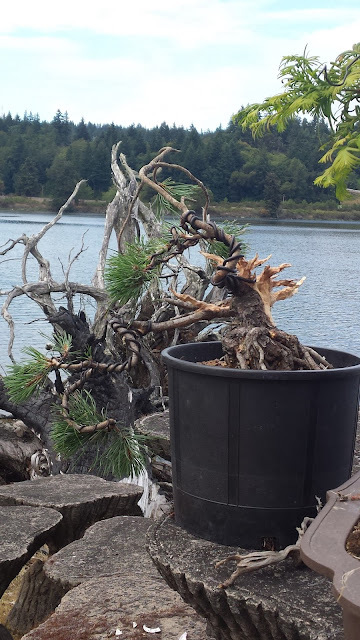 He clipped off the majority of the branches, leaving their stubs to carve into deadwood (if you haven't met Dan or seen his garden, deadwood is kinda his big thing - nearly all of his trees have interesting deadwood features). The dead branches he selected are concentrated on one side and the top of the tree, illustrating a story in which the tree faced hardship which killed off growth in that direction (it could be said to still be like a windswept style in that sense).